The Common Dolphin may not be so common in New Zealand waters in the future if more deaths - such as the 22 killed in a single bycatch by commercial fishing boats - occur, says Massey University marine biologist Karen Stockin. She prompted the Minister of Conservation Steve Chadwick into releasing photographs - through an official information request - of battered, bloody carcasses of 22 Common Dolphins caught last December in trawl nets off the West Coast of the North Island. She feared conservation and fisheries authorities had become complacent about the real plight of the dolphins because of insufficient data regarding their true conservation status. Her own research shows that Common Dolphins’ foraging and resting behaviour has been detrimentally affected by dolphin-watching tour boats in the Hauraki Gulf. 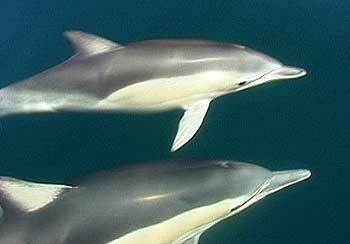 The same dolphin population is also vulnerable to pollutants, and has been captured in offshore trawl fisheries. Ms Stockin’s research shows common dolphins are most vulnerable to offshore trawl fishing at night, as diet analyses suggest they move further offshore to feed. Previous estimates suggest up to 300 Common Dolphins are killed annually in just jack mackerel fishing alone. “That estimate, extrapolated from observer data, doesn’t account for Common Dolphins that become entangled and die in recreational set nets,” said Ms Stockin. Tougher measures and penalties were needed to ensure fishing boats abided by codes of practice requiring them not to drop their nets in the presence of dolphins. “Ideally, no trawling should occur between 2am and 4am, the time dolphins usually feed on the deep scattering layer and become entangled in trawl nets”.